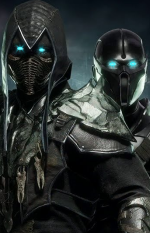 Kotal Kahn's control over Outworld was short lived: Shao Kahn's faithful daughter, Mileena, ensures her father's rule is restored by enlisting the help of her Tarkatan ally, Baraka. Turned-on by his blood lust, Skarlet begs her emperor for just a taste of blood from his hammer. This was my submission to 2018's fake picture kontest. Just as raw and amazing as the first time you showed me. I've only seen two people take a crack at Shao Kahn face: you and MKRocket. This has to be one of your best artwork. Love it. Now that's a Coup d'état. I like how this fake has some lore to it. Great sprite work and awesome background. Speaking of that, can you post a version that is undarkened? No, cuz that's how the background was made. The only thing I darkened was my Mileena sprite.